Assessment in the MYP is best described as internal, as opposed to external, because the assessment tasks, strategies and tools are designed, developed and applied by teachers working with students in their schools. Alliance Middle School currently does not participate in the MYP’s optional, external e-assessment because we end at year three. The IB believes that teachers are best placed to assess the work of their MYP students; the assessment model supports the professional judgment of the teacher in deciding the levels of achievements of individual students. Grade level department teacher teams collaborate on the assessment of student work. They share student work and identify “what” each achievement level should look like. The MYP assessment model is also described as criterion-related, as it is based upon predetermined criteria that all students should have access to. The MYP identifies a set of objectives for each subject group, which are directly related to the assessment criteria of that particular subject group. The level of student success in reaching the objectives of each subject group is measured in terms of levels of achievement described in each assessment criterion. Alliance Middle School students are assessed in each of the eight MYP subject areas. Subject areas all have four established objectives (A, B, C, D), and student achievement levels (0-8) are based upon their meeting of the criteria for that level. Individual student work is not compared to other students’ work but is compared to set standards (the assessment criteria). While the assessment criteria vary some in different subject areas, they are derived from four core components: knowledge, understanding, skills, and attitudes. 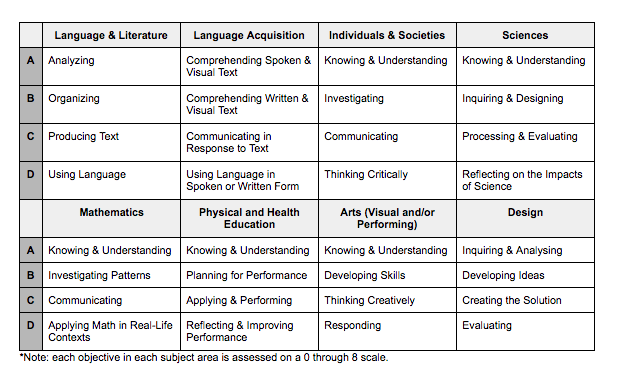 See below for a list of MYP subject areas and aligned assessment criteria. Frequency of Alliance Middle School Assessment Using IB Criteria:*Note: each objective in each subject area is assessed on a 0 through 8 scale. While individual teachers may assess more frequently, teachers are responsible to formally assess and report on each criterion of their subject area twice yearly. Typically, this is done at the end of each semester but can vary. While informal communication with parents may take place more frequently, all subject areas will formally report student achievement of all assessment criteria at least once per semester. The following link provides more comprehensive information about IB Assessment at Alliance Middle School.